On a beautiful, sunny, crisp Thanksgiving Day this year my wife, two of her sisters and I were in Nebraska City, 40 miles south of Omaha on the western bank of the Missouri River near the southeastern corner of the State of Nebraska. Appetizers: shrimp, crab claws, oysters, mussels, fruits, cheeses and various salads. Entries: slow-roasted turkey, prime rib, glazed butternut squash, apple sage stuffing, whipped potatoes, baked yams, vegetable medley, baby carrots and rolls. Desserts: pumpkin, pecan and fruit pies; cupcakes; and other classic items. 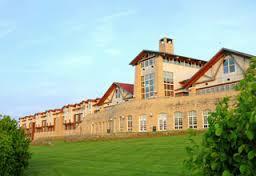 The Lodge & Center is owned and operated by the Arbor Day Foundation, which seeks to “inspire people to plant, nurture and celebrate trees.” In so doing, the Foundation celebrates the life and vision of one of the town’s most famous citizens, J. Sterling Morton. The day in Nebraska City also unexpectedly became a fascinating lesson in late 19th and early 20th century U.S. history. In 1854, the Kansas-Nebraska Act of that year created the two territories with those names and opened them for settlement. Enticed by the prospect of owning land in this new Territory, Morton at age 22 came to Nebraska City, really a village of less than 2,000 and the Territory’s first city, with his wife, Caroline (“Carrie”) Ann Joy French Morton, an accomplished artist, musician and gardener. Mr. Morton, who was a graduate of Union College, started the Territory’s first newspaper, the Nebraska City News, and served as its Editor. He also immediately bought land in the town, presumably under the Preemption Act of 1841 permitting “squatters” who were living on federal government-owned land to purchase up to 160 acres at a very low price (not less than $1.25 per acre), before the land was to be offered for sale to the general public. As a nature lover with a passion for horticulture, Morton was appalled by the lack of trees in Nebraska, but soon planted various kinds of trees on his own property. In order to attract people to the Territory (and then State in 1867), Mr. Morton endeavored to encourage others in the area to plant trees. He did that first as Editor of the local newspaper and then as President of the Territory’s Agricultural Board. In 1872, he proposed that the state declare April 10 as Arbor Day, and his proposal was accepted. On that day in 1872, it is said that Nebraskans planted one million trees. In 1885, Nebraska declared his birthday, April 22, as Arbor Day and made it a legal holiday. Morton also was engaged in public service as a member of the Nebraska Territorial House of Representatives (1855-1858); Acting Governor of the Territory (1858-1859); and Secretary of the Nebraska Territory (1858-1861). In 1860 Morton won an election to Congress, but lost a challenge to his election in the Republican-controlled House. He also ran four unsuccessful campaigns for governor after Nebraska became a state in 1867. 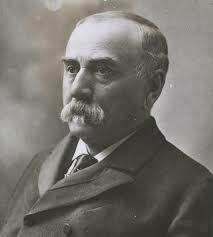 In 1893 President Grover Cleveland, with widespread acclaim, appointed Morton as U.S. Secretary of Agriculture. In his four years in that position he expanded and improved the Department’s programs while turning back to the Treasury over 20% of its appropriated funds. 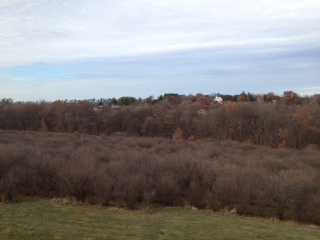 Before our Thanksgiving dinner at the Lodge, my wife and I went out on its north-facing balcony to see the beautiful valley full of trees and a test plot of hybrid hazelnut bushes. 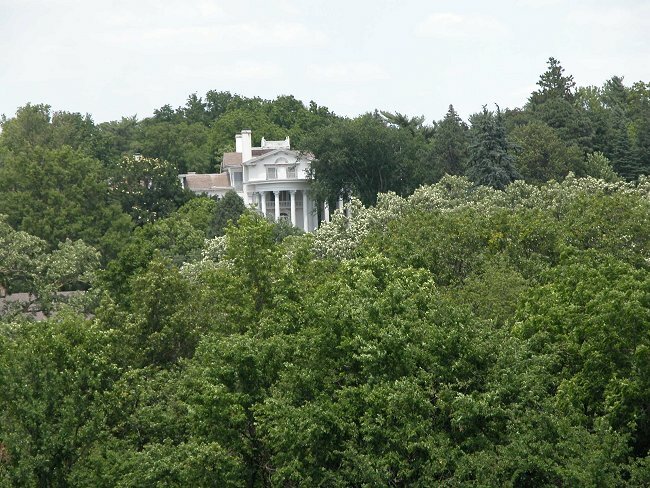 We were surprised to see on the opposite hill a strikingly handsome pillared white house peaking out through the trees as shown in the top photographs (the middle one is courtesy of the Arbor Day Foundation.) We then discovered that this was the 52-room mansion of Mr. Morton that is a reasonable facsimile of the White House in Washington, D.C. as shown in the third photograph. 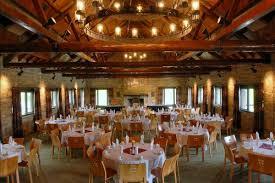 The mansion is now called the Arbor Lodge in the Arbor Lodge State Historical Park and Arboretum, which we drove by after dinner. Unfortunately the Lodge was not open for visitors that day to see its Victorian and Edwardian furnishings, Tiffany skylight and collection of artifacts of early Nebraska history. 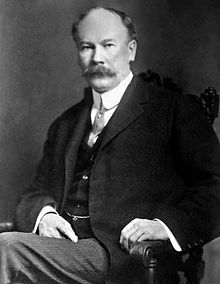 Sterling and Joy Morton had four sons: Joy (1855-1934), Paul (1857-1911), Mark (1858-1951), who was involved in various family businesses, including the Morton Salt company; and Carl (1865-1901), who was a businessman with another family business, the Argo Starch Co., and with the Glucose Sugar Co. Mrs. Morton died in 1881; J. Sterling Morton, in 1902. 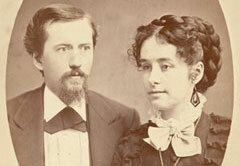 Sterling and Joy Morton’s first son, Joy Morton, was born in Nebraska City in 1855. At age 15 he began to manage the family farm and estate and to work in a local bank. Later he worked for railroads in Nebraska and Illinois before joining a Chicago salt distribution company in 1880. By 1899 he had acquired majority control of the firm and renamed it “Joy Morton & Company,” and in 1910 he incorporated it as the subsequently famous Morton Salt Company. 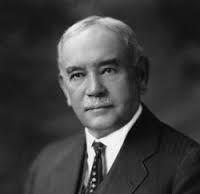 He was its president until 1930 when he became its chairman of the board, a position he held until his death in 1934. His brother Mark also was involved in the salt company. 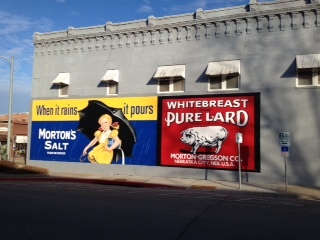 While driving around the town of Nebraska City this Thanksgiving Day I was amused to see these large signs for Morton-family businesses brightly painted on the brick wall of a downtown building: “Morton Salt” and “Morton–Gregson Co.“ The latter was a hog packing plant that was organized in 1901 and after financial problems was sold in 1917 to Wilson & Company. Carrying on his parents’ interest in trees and gardening, Joy Morton in 1922 established The Morton Arboretum on 178 acres of land adjacent to his estate in Lisle, Illinois, roughly 26 miles west of Chicago, to display woody plants that grow in temperate zones around the world, to educate the public about them and to conduct research on their management and preservation. 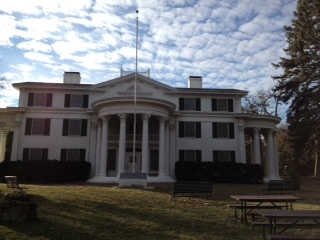 After his father’s death in 1902, Joy Morton redesigned and enlarged the family mansion in Nebraska City into its current size and used it as his family’s summer home until after 1922 when he donated the mansion (now the Arbor Lodge) and surrounding property to the State of Nebraska to be its first state park. Paul Morton was born in Detroit, Michigan in 1857 and grew up in Nebraska City. After turning 18, he moved to Chicago, where he worked for the Chicago, Burlington and Quincy Railroad, attaining the position of General Freight Agent. He then was an officer and director of Colorado Fuel and Iron Company before he joined the Atchison, Topeka, and Santa Fe Railway, where he became a Vice President. The close connection between Paul Morton and Roosevelt is shown after the Republican convention had nominated Roosevelt as its vice presidential candidate in June 1900. Roosevelt visited Chicago as a guest of Morton in order for both of them to board the latter’s private Santa Fe railroad car to go to Oklahoma with two Republican National Committeemen and three fellow Rough Riders for a reunion of the Rough Riders Regiment as Morton and Roosevelt had done the prior year for another such reunion in Las Vegas. When and how the two of them first became acquainted are intriguing questions I was unable to answer. In September 1900, as discussed in a prior post, he and two other railroad executives accompanied candidate Roosevelt on his campaign train from Quincy, Illinois to Chicago. The other railroad executives on the train were my maternal great-great-uncle, William Carlos Brown, then General Manager of the Chicago Burlington & Quincy Railroad; and Theodore P. Shonts, then the President of the Illinois & Iowa Railroad. I have not been able to discover the substance of the conversations the four of them had on the train, but perhaps they discussed the issue of federal regulation of business, especially railroads. The three railroaders presumably were present at the end of the train ride in Chicago on Labor Day to hear candidate Roosevelt’s “The Labor Question” speech, in which he said he had been “thrown into intimate contact with railroad men [and] . . . gradually came to the conclusion that [they] . . . were about the finest citizens there were anywhere around.” Teddy must have included these three railroad executives in that illustrious group. Though he knew next to nothing about naval affairs, the Senate confirmed Morton’s nomination in December 1904. A problem for Morton emerged early the next year when the Interstate Commerce Commission asked the Justice Department to investigate charges that Morton had acted illegally as an officer of the Atchison, Topeka & Santa Fe when it paid rebates to the Colorado Fuel and Iron Company, Morton’s prior employer, from 1902 though 1904. Morton subsequently admitted the rebates had been paid even though he had no knowledge of them at the time and even though he had instructed subordinates to not pay any rebates. These charges never resulted in his prosecution, but they did force Morton to resign quietly on June 30, 1905. In all of this, President Roosevelt supported Morton and had Morton with him on a private railroad car trip early the next month and later that month had Morton for a private over-night visit at Roosevelt’s Sagamore Hill home at Oyster Bay, New York. In any event, Morton immediately after leaving the Navy became the President of the Equitable Life Assurance Society in New York City, and in 1909, he was appointed as the vice chairman of a commission to reorganize the Navy. Paul Morton died in 1911. After leaving Nebraska City and doing research for this post, I discovered that this town, current population of nearly 7,300, also is home to the Mayhew Cabin, the only site in the state of the Underground Railroad in the 19th century, and the Missouri River Lewis and Clark Center, which focuses on the natural history achievements of that 1804-1806 expedition. 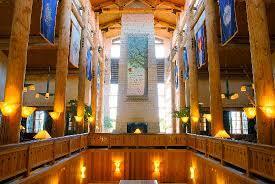 The town sounds worth another visit to see these sights as well as the interior of the Arbor Lodge. As a non-Nebraskan, I earnestly solicit comments and corrections. I also give thanks to Amy Stouffer, Marketing Director of the Arbor Day Foundation, for her assistance. This section is based upon Anderson, Julius Sterling Morton, Forest History Today at 31 (Fall 2000); Wikipedia, Julius Sterling Morton; Will Be in the Cabinet: J. Sterling Morton for Secretary of Agriculture, N. Y. Times (Feb. 18, 1893); Morton A Man of Strength, N. Y. Times (Feb. 19, 1893); John R. Thomas and Congressman Harter Praise Mr. Morton, N.Y. Times (Feb. 19, 1893); The Cabinet Selections, N.Y. Times (Feb. 20, 1893); Editorial, Julius Sterling Morton, N.Y. Times (Feb. 20, 1893); Praise for the New Cabinet, N.Y. Times (Feb. 23, 1893); Editorial, Mr. Cleveland’s Cabinet, N.Y. Times (Feb. 23, 1893); Mr. Cleveland’s Cabinet, N.Y. Times (Feb. 26, 1893); Julius Sterling Morton of Nebraska, N.Y. Times (Mar. 5, 1893); Gold Democrats Banquet, N.Y. Times (Jan. 9, 1897); Elections in Other States, N.Y. Times (Oct. 31, 1897); Palmer Democrats Speak, N.Y. Times (May 13, 1900); Abram S. Hewitt on Bryan, N.Y. Times (July 1, 1900); Bryan’s Impeded Veracity, N.Y. Times (Oct. 8, 1900); Anti-Imperialists’ July 4 Manifesto, N.Y. Times (July 4, 1901); J. Sterling Morton Dead, N.Y. Times (April 28, 1902). I have not yet read James C. Olson, J. Sterling Morton—Pioneer Statesman and Founder of Arbor Day (1942). The Kansas-Nebraska Act of 1854 allowed the future white male settlers of the territories determine through popular sovereignty whether each would allow slavery within its borders. The principal supporter of the Act was Democratic Senator Stephen A. Douglas of Illinois who saw the Act as a compromise to gain Southern support in order to promote the eventual construction of a transcontinental railroad from Chicago The opponents of the Act saw it as a betrayal of the Missouri Compromise of 1820, which had banned slavery in Kansas. In opposition to the Act, the Republican Party was created to stop the expansion of slavery. In the famous 1858 debates between Senator Douglas and Abraham Lincoln, the latter argued that Douglas was part of a conspiracy to nationalize slavery and that the Kansas-Nebraska Act was the first step in that direction. OI course, two years later (1860), Lincoln was the Republicans’ successful presidential candidate. In the meantime, after passage of the Act, pro- and anti-slavery adherents flooded into Kansas to vote slavery up or down, leading to a low-intensity civil war that became known as “Bleeding Kansas.” In 1860 the Kansas territorial legislature passed, over a governor’s veto, a bill banning slavery and in 1861 Kansas entered the Union as a State. In Nebraska the territorial legislature in 1861 passed, over a governor’s veto, a similar bill prohibiting slavery although Nebraska limited the vote to “free white males,” a provision that delayed Nebraska’s becoming a state until 1867 after the elimination of this provision. I have not read In Memory of Caroline Joy French Morton, Wife of J. Sterling Morton (1882); Margaret V. Ott’s biography of Mrs. Morton: Sterling’s Carrie: Caroline Ann Joy French, Mrs. J. Sterling Morton, 1833-1881 (1992). Grover Cleveland and Morton were prominent conservative or Bourbon Democrats, opposing imperialism and U.S. overseas expansion and supporting the gold standard for U.S. currency. Public support for this philosophy was damaged by the Panic of 1893 when Cleveland refused to expand the money supply with silver. This lead to the Party’s granting its 1896 presidential nomination to Nebraskan William Jennings Bryan after his “Cross of Gold” speech urging silver as an additional backing for the currency. In response, some of the Bourbon Democrats formed their own unsuccessful political party (National Democratic Party) to advance their policies; but their presidential and vice presidential candidates were badly defeated in the 1896 election. These conservative Democrats often were referred to as the “Gold Democrats” for their support of the gold standard. In 1900 Democrat Morton endorsed Republican William McKinley because Morton detested Bryan’s bimetallism and admired Teddy Roosevelt, the Republican vice presidential candidate; Morton deemed these reasons more important than his strong disagreement with McKinley’s trade protectionism. This section is based upon Wikipedia, Joy Morton and Wepman, Joy Morton, American National Biography Online. I have not yet read Ballowe, A Man of Salt and Trees: The Life of Joy Morton (2009). This section is based upon Wikipedia, Paul Morton; University of Virginia Miller Center, Paul Morton (1904-1905) Secretary of the Navy; The Governor’s [Roosevelt’s] Western Trip, N. Y. Times (June 26, 1900); Governor [Roosevelt] Goes West, N. Y. Times (June 30, 1900); Roosevelt in Chicago, N. Y. Times (July 1, 1900); Roosevelt Going West, N. Y. Times (July 2, 1900); Roosevelt Leaves Chicago, N. Y. Times (Sept. 2, 1901); Changes in Cabinet Officially Announced, N. Y. Times (June 25, 1904); Morton Enlisted in Navy, N.Y. Times (June 26, 1904); Mr. Morton’s Case, N. Y. Times (June 23, 1905); Morton’s Rebate Testimony, N. Y. Times (June 23, 1905); Bryan on Roosevelt, N. Y. Times (June 25, 1905) ; President at Home Again, N. Y. Times (July 7, 1905); Knapp Praises Morton, N.Y. Times (July 9, 1905); Taft To Run the Canal, N.Y. Times (July 23, 1905); Theodore Roosevelt, Autobiography (1913).